Product Dimensions (L x W x H): 33" x 5.5" x 28"
Our America Yacht model is scratched built plank on frame from cherry wood and clear varnished. This model is completely hand built by skillful and creative master craftsmen; you will be amazed at how real it looks. The shines on the hull is truly beautiful. 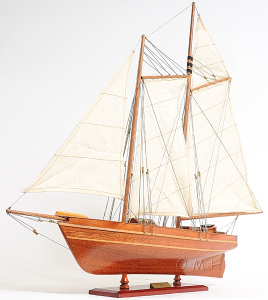 Pure wooden ornaments such as: 3 wooden stands, 3 wooden bunkers, 3 large masts with fabric sails and detailed stitching, all rigging are matching colors, 1 metal stick in the navigation area, 1 wooden propeller, 1 long stripe around the hull of the yacht, and many more. We absolutely use no plastic parts only high quality wood and metal. Our model was built according to scale through original plans, pictures and drawings. This beautiful model is rested on a painted wooden stand with 2 crafted poles sustaining it. To enhanced value and recognition, a metal plate embedded with America 1851 is neatly glue to the stand. The masts are fold flat down for easy shipping purposes. Semi-assembly are required. The 19th century racing yacht, America, was given its name after the first international sailing trophy that it won - the America's Cup. This schooner was designed by George Steers for Commodore John Cox Stevens and a syndicate from the Yacht Club of New York. On Aug 22, 1851, the America won by over 20 minutes in the Royal Yacht Squadrons 53 mile regatta around the Isle of Wight, capturing the"One Hundred Sovereign Cup. Queen Victoria, who was watching at the finish line, was reported to have asked who was second, the famous answer being:"Ah, Your Majesty, there is no second.